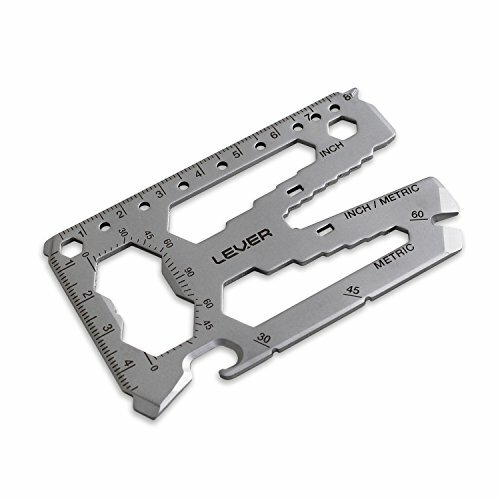 The Lever Gear Toolcard Pro packs 40 tools into a beautifully crafted, minimalist wallet multitool. Slim yet super strong and TSA compliant; it's always with you so you can get things done. You'll find yourself using this for things you never imagined. Tools include: A bottle opener, can opener, box opener, cord cutter, pry bar, Phillips screwdrivers, flat head screwdrivers, inch ruler, metric ruler, 8 inch closed end wrenches (3/16" - 9/16"), 8 metric closed-end wrenches (5mm - 15mm), 8 open-end wrenches (metric 7,8,10,11,13mm, inch #4,#6,#8,#10,¼",5/16"), ¼" Hex bit holder, protractor, speed square, straight edge, graduated compass (draw circles). Each Toolcard comes with a protective sleeve. Built to last. The Toolcard Pro is built for people who demand quality tools and like to be prepared to handle everyday tasks as they arise. We believe it's simply the best, most functional multi-tool you can fit in your wallet. It's made in America from heat-treated 420 Stainless steel, has a beautiful bead blasted finish, and is laser marked for high-contrast, permanent graphics. With a unique blend of style and function, the Toolcard Pro is the perfect gift for dads, grads, gear lovers, designers, EDC aficionados, DIYers, makers, minimalists, hikers, homeowners, and anyone who likes cool tools. 100% Guarantee! We know you'll love your Tool card, but just in case you change your mind we offer a 60-day money back guarantee as well as a lifetime warranty against breaking or manufacturer defects. So scroll up and get yours today and start being prepared for anything. PREMIUM QUALITY - Beware of knock-offs. The Lever Gear Toolcard Pro is made in the USA, heat treated 420 stainless steel, satin finish, laser-etched permanent graphics. SUPREMELY FUNCTIONAL - Packs 40 tools into a credit card-sized multi-tool including wrenches, screwdrivers, bottle opener, can opener, prybar, cord cutter, hex bit driver and more. GOES ANYWHERE - Slips easily into your wallet or bag, TSA compliant for travel, weighs just 1 ounce. PERFECT GIFT - Great as a Father's Day gift, graduation gift, wedding or groomsman gift, golf tournaments, corporate gifts, etc. NO RISK - 60 day 100% money back guarantee, lifetime warranty. If you have any questions about this product by Lever Gear, contact us by completing and submitting the form below. If you are looking for a specif part number, please include it with your message.